You are here: Home / Newsletters / July 11, 2017 Newsletter- Craft Classes Galore! July 11, 2017 Newsletter- Craft Classes Galore! Fill your July with Creativity! There are still spots left through July 20th for our Summer Craft and Activity Classes. Add some fun to your summer days in July. 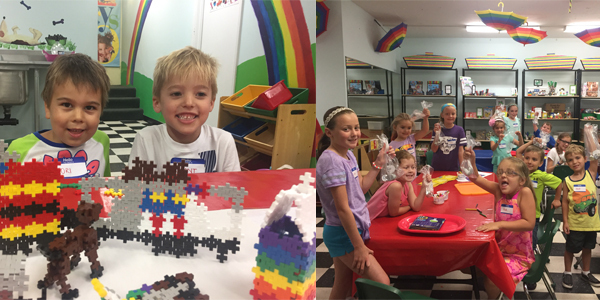 Join us in the Rainbow Room at Corinth Square for crafts and activities. Sign-up NOW! Create a Masterpiece! Ages 4+ Let your vibrantly colored Kwik stick take a walk across the paper and create a masterpiece! We’ll look at some classic art work for inspiration and then paint with these- no water, no mess, quick dry art sticks! Sun-sational Stained Glass! Ages 4+ Start with a template and peel and press stickers to create a cool ‘stained glass’ project. Attach a cord and suction cup and your finished project will hang in the window and shimmer in the light! One Shape Endless Building! Ages 5+ Builders and designers this one’s for you! Dig into our buckets of Plus Plus building bricks and create a 2D mosaic or 3D structure- the possibilities are endless using Plus Plus! When we’re through take home your own 75 piece tube for more building fun. Hands Down…That’s Art! 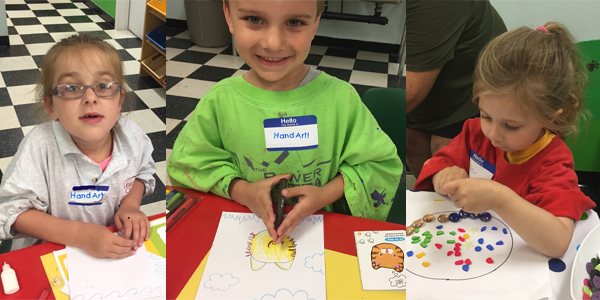 Ages 4+ Draw a giraffe in a jungle scene or a car in a city-scape using your very own hand! Kids will be delighted as they see their simple hand tracing come alive! You’ll get 5 scenes to make your designs and pom-poms and googly eyes for fun. We’ll frame them and they’ll be display-ready to take home! A Maker Day! Create your way! Ages 5+ What happens when a kid opens a Creativity Can filled with carefully selected, inspiring materials? Imaginations soar and wildly creative ideas are let loose! Straw, string, colored paper, wooden shapes, wheels, pipe cleaners, clothespins…plus glue, tape, and stickers to hold it together will turn on the Maker in you! Click Here to Sign Up for these FANTASTIC Summer Activity classes online or call to register at 913-385-1234. Like to Play On The Job? We’re putting the call out for candidates to interview for late summer and fall positions at the Learning Tree. Do you know someone who would be a great addition to our team? We are always looking for enthusiastic individuals to join our talented retail staff of toy and playtime experts. Click below for an application or stop by to pick one up. Open our Summer Catalog and See How Fun Summer Can Be! Scramble Bugs, crazy Lovely Llamas, Slackers NinjaLine Intro Kit, and Light Up Capture The Flag will help you welcome Summer! Stay cool and protected with clip-on Water Bottles and Super Sparkle Screen, the kind-to-your-skin 30+ sunscreen that sparkles! Click the image to open the catalog. Then, you can “turn the pages” on your computer. Each image links to the item in our online store with additional info and photos. See something you like? Buy it online, then stop by either store to pick it up. Shopping couldn’t be easier! 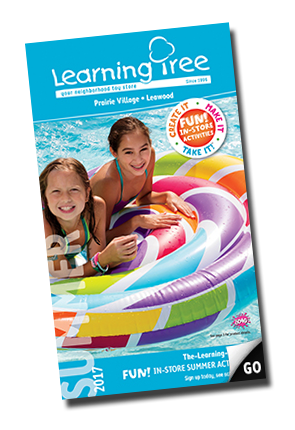 The catalog also includes a full list of our in-store Summer Activity Classes. Kids Gardening Classes with Rosehill Gardens followed by the Learning Tree Summer Storytime. You know that feeling you get when you find a shiny penny or a four-leaf clover? Hide and Seek Rocks bring the same special, lucky, “kick-up-your-heels happy” feeling when someone finds one! Here’s your chance to join in on an international craze and get your hands on a NEW kit from Creativity for Kids during a fun FREE Friday morning activity! Hide & Seek Rock Painting is a fun way for you, your friends and family to get creative and spread kindness, encouragement and happiness throughout our local community – one rock at a time. Bring your friends and family and we’ll have everything set up ready to go! It’s easy as 1-2-3! Paint, post, (using our special social media ID) and hide ‘em! Live Music, Free Food, and Fun! There’s Neighborhood fun at the Franklin Park Fourth Friday Concerts! Daniel Miyares will be back in July! Saturday July 29, 10:30am, Corinth Square: Book Signing, Story Reading and Celebration! It’s a NEW book from our favorite local author/illustrator, Daniel Miyares! Acclaimed writer Daniel Miyares returns to the sweet, nostalgic tone of his beloved illustrated book, Float, in That Neighbor Kid. This gorgeous, spare picture book is all about making a new friend.